For many people, it is important to have a home that smells pleasant and fresh. Nice fragrances can really make your home more comfortable and welcoming, and they can also cover up the natural unpleasant odors that come along with living life. There are many ways to add a pleasant fragrance to your home, but one of the easiest is by using a reed diffuser. Reed diffusers consistently add fragrance to your home, releasing it throughout the day so your home develops an evenly pleasant smell. In this article, we’ll cover how to find the best reed diffuser for your home, and review some of our favorite options. How do Reed Diffusers Work?What are The Benefits of Reed Diffusers?What should You Look for When Purchasing a Reed Diffuser? 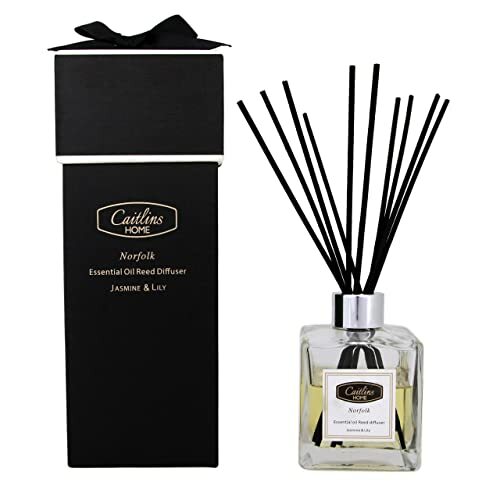 Reed diffusers consist of a set of reeds inserted into a jar or pot of fragranced oils. The reeds naturally transfer the frangrance of the oils into the air when they absorb them. This is a very similar process to a plant absorbing water, but instead of keeping the oils inside, the reeds are designed to release them into the air. Since they do this at a consistent pace throughout the day, you get a fragrance that is subtle but lingers in the air. There are many benefits to using a reed diffuser in your home. In particular, they provide many advantages over other types of home fragrance options, such as candles or room sprays. Reed diffusers do not require any heat or flame to work. You can leave your reed diffuser out unmonitored throughout the day, without fear that it will do damage to your home and the people in it if there’s an accident. There’s also no smoke involved. Reed diffusers are very clean. Candles, room sprays, or wax burners can leave residue on nearby surfaces, which require maintenance. Reed diffusers do not have this problem - you can place them anywhere and just leave them there. Reed diffusers produce a scent that is noticeable without being overpowering. Many other home scents can be irritating if you use too much, particularly for guests who are visiting your home. Reed diffusers release the perfect amount of fragrance. Unlike other types of home fragrance, reed diffusers can last for months on end. This means that you get great value for money and you don’t have to worry about maintaining your room’s scent. What should You Look for When Purchasing a Reed Diffuser? Scents are a very personal choice, and if you can, it helps to smell the oils in person. If you are purchasing online, you can still find scents you like by looking at the notes that are included in the oils. Ideally, the bottle or jar should have a narrow neck to prevent too much of the oils from evaporating. A narrow opening will result in a more concentrated, effective scent. You'll also want to take into account the material that the container is made of - some people like the look and feel of glass, while others prefer something less breakable. If you want a concentrated scent, you’ll want to look for a diffuser that uses rattan reeds as opposed to bamboo. Bamboo also works well, but the scent will be more mild as the oils cannot pass through the bamboo as easily due to their shape. Whichever type of reed you end up going with, it’s important to make sure they are real and all-natural, as some products use faux bamboo reeds that won’t have the same effect. Many people like to display their diffusers on a shelf or table, so it helps if they are packaged well and look nice among your home decor. It also helps to take the size of the diffuser into consideration and make sure it fits in your home easily. 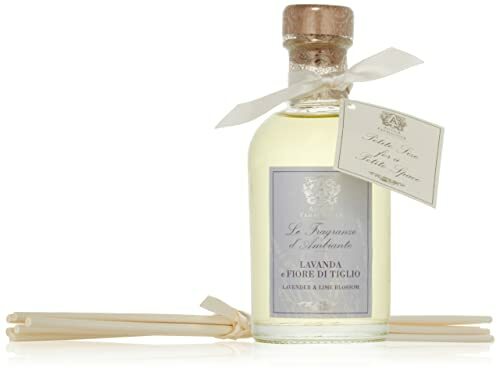 The jasmine bamboo scent in this reed diffuser is appeals to many different tastes. Jasmine has a warm and exotic feel that combines fruity and earthy tones. Bamboo is fresh and relaxing, reminiscent of the rainforest. This glass diffuser has a very classy design, with a gold lid and black reeds that look appealing in any home and go well with a variety of decor styles. The oils are also completely natural, and are free of alcohols and parabens. The set comes with 120 ml of oils, which is intended to last for up to four months. It also comes with a guide showing you exactly how to use the reed diffuser kit. 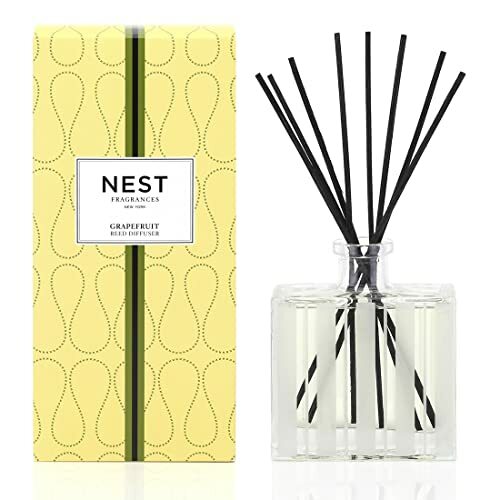 Nest has become very well-known for their high quality candles, but their reed diffusers have proven themselves to be just as good. This diffuser comes in four different scents - grapefruit, cashmere suede, apricot tea, and white camellia. All of the fragrances have notes that are very refreshing and bright, but each have their own unique notes to appeal to those with different tastes in fragrances. The diffuser comes in a very stylish etched glass bottle that looks great in any home. The formula of the oil is alcohol free, and the reeds are made from a natural bamboo material. This essential oil blend is designed to create a relaxing atmosphere in your home. The combination of jasmine and lilies works beautifully in a way that is very relaxing and is even thought to relieve stress. The oil is free of alcohol and VOC, so it is a healthy blend of oils. This set is unique in that it comes with many reeds, and you can add or take away reeds depending on how intense you want the scent to be. The design is quite stylish as well, with black reeds and a glass bottle. The scent can last for over four months with the 125 ml bottle, and the company offers a money back guarantee and replacement if you have any issues with your diffuser. This reed diffuser comes in a huge variety of scents - there are a total of 14 available, ranging from light fragrances like Pink Mimosa to heavier choices like Red Currant. Each scent is light yet very appealing and true to what you would expect. The set also comes with a huge amount of oil - the bottle totals 216 ml, which can last for over four months. The product is made in the United States and ships quickly. The downside to this product is that it does not specify whether or not the oil blend is natural, so if you are concerned about alcohols or parabens, this may not be a great choice for you. This adorable reed diffuser is both functional and very stylish. It comes in an apothecary-style bottle that fits in perfectly with many home decor themes, such as rustic or minimalist styles. The brand sells a total of 21 scents, ranging wildly from the delicate Peonia, Gardenia, and Rose to the heady Manhattan (yes, inspired by the cocktail). The company also offers 100, 200, and 500 ml sizes to suit your needs. The largest size can last as long as six months, which provides great value. The oils are made with complex, high-quality blends, and the reeds are made from white birch, which provides an even scent throughout the room. With so many great reed diffusers to choose from, it was difficult for us to pick a favorite. However, we most recommend the Antica Farmacista because of their wide range of scents available, as well as the option to choose from multiple sizes.